If you would like more assistance, feel free to call The Cottages at Chapel Creek at (888) 724-6551 so that we may help you in the best possible way. The Cottages are state-of-the-art certified assisted living residences for people living with Alzheimer’s and other memory disorders. Under the direction of our highly qualified, 24-hour staff and 7 days-a-week nursing, we provide personal care assistance, medications supervision, meals, snacks and specialized activities. Our all-inclusive pricing means no hidden fees and all services and care is included. 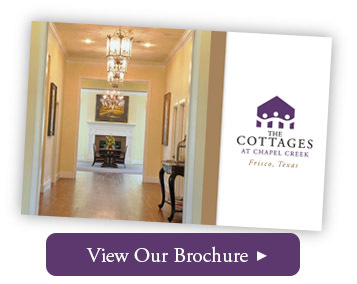 Please visit the Resources & Blog to learn valuable information for Caregivers and Loved Ones and download our brochure to learn even more about The Cottages at Chapel Creek.